With the new year just around the corner, a lot of people are starting to think about moving. Are you currently renting a home and looking to buy your first home? Do you want to sell your starter home and move into a bigger place? How about those of you who have so much unused space and want to just downsize? Whatever the reason, if you are thinking of buying or selling, Im sure one of things that you are thinking is how much it will cost. The first thing you should is contact a Realtor right? But wait! How do real estate agents get paid and how much do they make? Related Article: What’s the difference between a Real Estate Agent and a Realtor? So, how do real estate agents get paid and how much do they really make?? The quick answer is that real estate agents and Realtors work for a Real Estate Brokerage. Whether its a National Brokerage or a local brokerage, the agent gets paid from the brokerage from the commissions that are earned by them when they help a buyer or seller close on a sale. 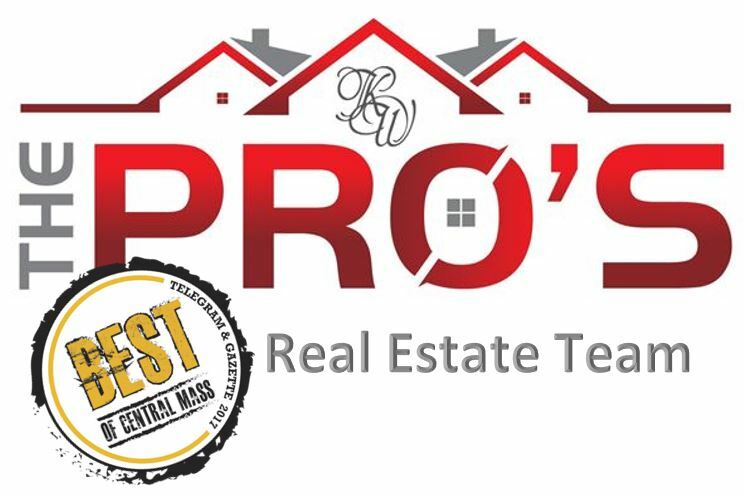 Here in Massachusetts, Realtors make a little more than the National Average. 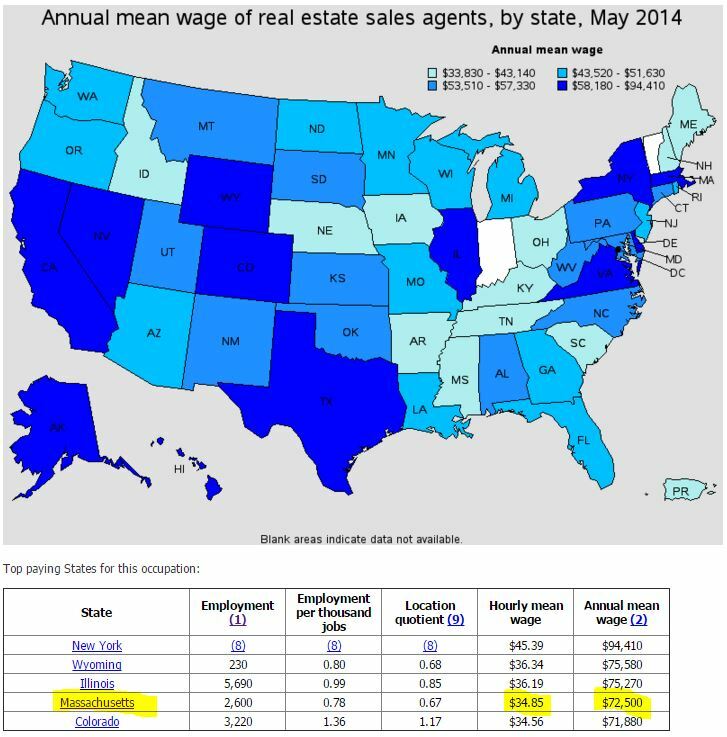 The annual mean wage for a Massachusetts Realtor is $72,500 (1) with above average agents making more. While this may seem high, it is just a small amount considering what an agent actually has to do to earn their money. While above is a fairly quick answer, here is the not-so-quick answer. Real Estate agents actually interview the Brokerage they are considering joining. They ask questions about training, possible leads, splits, caps, desk fees, and what charges they will incur. They want to find out what the brokerage can offer them and essentially learn “why” they should join that company. When the agent joins, they are generally agreeing to a certain commission split with the brokerage. This means that when a commission is paid to the brokerage as a result of a sale, it’s split between the brokerage and the agent. Brokerage splits can be 40/60 (broker/agent) 50/50, 60/40, 70/30, 80/20, 90/10. These splits will vary from brokerage to brokerage and could vary from agent to agent within that brokerage based upon performance level. This is something that is agreed upon when the agent joins the brokerage. With that being said, a conventional real estate transaction will have 1-4 agents/brokerages involved who will all get a split of the commission. Up to 4 agents/brokerages in one transaction?! Listing agent – This is the agent that met with the homeowner looking to sell their home. The homeowner went into an agreement with this agent and hired them to sell their home. In addition to hiring this agent, the homeowner has agreed to hire the brokerage this agent is a part of. The seller signed an agreement that dictated the terms of the listing – sales price, listing timeframe, the commission paid to the listing brokerage and the amount that will be offered to another agent who may bring a ready, able, and willing buyer. Buyer’s agent – The buyer’s agent is an agent who is working with a buyer to help them find a home. This agent will drive around and show the buyer potential homes that fit their criteria. This will be the agent that will work with the listing agent when a buyer wants to make an offer on a home. In some cases, the buyer’s agent can show a buyer a listing that they have – in this case, the agent is both a Listing agent and a Buyer’s agent. Buyer’s brokerage – Just like the listing brokerage, the buyer’s brokerage is the brokerage that the buyer’s agent works at. Now that you know the 4 possible agents/brokerages that are part a of transaction, let’s look at a couple of examples to breakdown how they each get paid after the sale of home. John and Sally write up an offer to present to Mary’s sellers for $285,000.00. Mary presents the offer to her sellers and they accept Sally’s offer. When the sale closes, Mary’s brokerage will get paid 6% of the sales price by the sellers. The question is how is how are John and Keller Williams Realty going to get paid for bringing a ready, able and willing buyer? The answer is: Mary and her brokerage will pay them. When the sellers hired Mary to sell their home, she placed the home into the MLS (multiple listing service). When the listing is entered into the MLS, part of that was to advertise the offered compensation to buyer’s agents. In this example, Mary offered a total of 3% to the buyer’s agent and their brokerage. How did the breakdown of commission work in this example? The sales price worked out to be $285,000.00. The sellers originally agreed to pay a commission of 6% to Mary and Hometown Realty. The total commission paid by the seller is $17,100.00, which is paid at closing to Hometown Realty. Hometown Realty agreed to pay 3% of the sales price as a commission to John and Keller Williams Realty. If you recall, Mary is on a 50/50 split with Hometown Realty and John is on a 70/30 split with Keller Williams Realty. Here is the breakdown of the commissions earned by all who were involved. Now lets take this one step further for you. John has earned a commission of $5,985.00 on this one sale. Wow! Seems like a lot of money right? Not quite, because John doesn’t get to keep all that. As an independent contractor, John is responsible to pay his own Social Security, state tax, and Federal taxes. Lets assume he puts aside 35% of that for taxes. That’s $2,094.75 which leaves him $3,890.25. With the remaining money John needs to set aside money towards his daily business expenses for advertising, internet, cell phone, and general marketing to keep his business moving forward. In addition to that, John has to pay for his gas, auto insurance, health insurance and retirement. Lets be conservative and say that’s another 30% for $1,167.08 now leaving him $2,723.17. This is more realistically the amount of money John will get to keep after selling the home. This is what he will live on UNTIL he closes another property because as a real estate agent, if you don’t sell a home – you don’t earn a commission. Sometimes for several months. Did we mention that as a Realtor, we don’t have unemployment benefits, workmans compensation, sick pay, paid holidays or paid vacations.. After you look at everything that goes into this, you will realize that the glamorous lifestyle people portray Realtors of having isn’t really that glamorous. Related Article: WHAT IS TRID? WHAT IS TILA-RESPA? WHY IS IT CHANGING? HOW DOES THIS AFFECT YOU? All real estate transactions can vary depending on which property a buyer purchases. There are not always that many agents/brokerages involved in each transaction. Let’s say Sally did not like Mary’s house. What if Sally liked a house that John had listed himself. This house was also listed for $300,000. The sellers agreed to pay John and his brokerage a commission of 6% of the sales price. Sally put in an offer on John’s listing of $285,000.00 that was accepted by the sellers. Now that you have a better sense of how do real estate agents gets paid – find out what WE do to earn our commission.